With their Andy Warhol Campbell’s Soup Can Chess Set, online retailer Kidrobot allows iconic pop art to be added to any game room. The set is just the type of interactive art accessory that would have accompanied the artist on his guest stint on The Love Boat. Kidrobot partnered with the Andy Warhol Foundation to create a chess set that utilizes different Campbell’s soup cans as chess pieces. Each can is 3-inches tall and comes complete with a felt accent. A label printed on the top of each can allows players to determine which type of soup corresponds to which chessman. 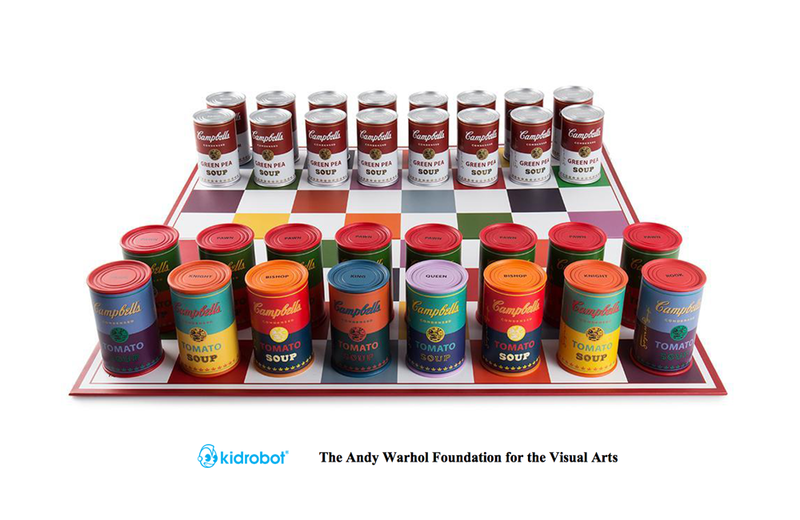 The Andy Warhol Campbell’s Soup Can Chess Set costs $500 USD at Kidrobot. It is also available from a variety of other online retailers. Spirography gets an upgrade with the Spirograph Die-Cast Collector's Set from Kahootz Toys. Doesn't everyone need some classic arcade decor in their home?! UK retailer The Fowndry's new Pac-Man Sound Chip Lamp lets you do just that!